This paper by Richard Bianco and Luis H. Toledo-Pereya has been edited with permission. Testing the safety of medical devices, such as cardiac valves and stents, in animals before they are introduced in human clinical trials is required for both ethical and legal reasons. Preclinical safety includes many improvements in technique, in vitro screening of devices, avoidance of financial interest in research outcomes, and investigator understanding of study model selection. These factors all enhance the ability to predict the safety and performance of medical devices in humans, as well as reducing the number of animals required for testing. (1-4). The remarkable success of the development, approval, and application to human disease of cardiac valve substitutes is a case study of the process and progress in preclinical research. The steps in the regulatory process are: Devices are first screened in the lab before being tested in animal models; those that are shown to be safe and effective in animals advance to human trials, and finally clinical use. 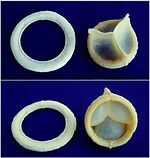 A mechanical artificial heart valve with tilting disc. Countless lives have been positively improved as a result of cardiac valve technology developed via this regulatory model. Relatively few clinical complications and deaths have resulted from poorly designed or manufactured heart valves. The in vivo, or animal phase, of the regulatory process is a required and is an effective technique to predict clinical safety. Over the past four decades, many improvements have been implemented in animal studies. These improvements have effectively reduced the number of animals used, while enhancing the effectiveness of the overall assessment of preclinical safety. The development of established and reproducible animal models to mimic the human condition, in this case valve replacement, has resulted in the site-specific implantation of devices in the anatomical positions in which the device would likely be used. Improved understanding of these models, relative to animal vs. device interactions, has resulted in a more accurate assessment of how complications arise — i.e., whether they stem from the animal model or the device. This delineation of results directly contributes to the understanding of potential clinical performance. As a result, results from animal testing may lead to a re-engineering of the device, or may demonstrate that the device is not implicated in the complication and can, therefore, proceed to human clinical trials (1-3). Moreover, the application of risk analysis to preclinical protocol development allows for better-designed studies that make more accurate determinations of the risk from each device. Refined protocols and more effective assessments of new or modified devices have reduced the need to repeat investigations due to poor design. Laboratories conducting preclinical investigations have also established data banks containing pathologic and performance results obtained from the implantation of the clinically approved devices used as controls. The banking of control data dramatically reduces the number of control animals needed in each subsequent assessment, since performance data of new devices can be compared to the banked historical control data. Finally, completely avoiding financial conflict of interest has resulted in an unbiased assessment of the preclinical safety of new or modified devices. It is important to note that not-for-profit laboratories are more effective at avoiding conflicts of interest. Importantly, there is an increased sense of the ethical burden imposed on the investigators and the staff involved with animal studies. This increased awareness has improved animal care and resulted in careful justification of the numbers of animals used, as well as the care and husbandry required to assure that each animal is treated with utmost care and respect. The prediction of clinical safety of new or modified heart valves (or other Class III) devices has been enhanced, refined and proven effective over the past four decades. The overall impact of this improvement has been a net reduction of the number of animals used, with an enhancement in the quality and accuracy of the preclinical safety assessment. The result has been the approval and clinical availability of lifesaving technology. Ultimately, patients benefit. Rivard AL, Suwan PT, Imaninaini K, Gallegos RP, Bianco RW. Development of a Sheep Model of Atrial Fibrillation for preclinical prosthetic valve testing. J. Heart Valve Dis. 16:314-323, 2007. Bianco RW, Gallegos RP, Rivard AL et al. Animal Models for Cardiac Research in Handbook of Cardiac Anatomy, Physiology and Devices for the Biomedical Engineer, Iaizzo PA, Editor, Humana Press. 2d. Ed. 2009, pp 393-410. Rakow N, Nelson DA, Falkner P, et al. Orthotopic Total Aortic Root Replacement Model in Adult Sheep. J Invest Surg. 20:55-59, 2007. Susuki Y, Yeung AC, Ikeno F. The importance of Preclinical Animal Testing in Interventional Cardiology. Arq Bras Cardiol. 91:348-360, 2008. Posted on July 22, 2013 July 22, 2013 by EditorPosted in News, Science NewsTagged cardiac valves, heart stents, human safety, Medical devices, Richard Bianco.